Truckers, along with workers in medicine, the military, emergency services and other essential jobs, often find the holidays to be extra stressful and discouraging. While others celebrate with loved ones, enjoy the comforts of hearth and home, go to parties and get some time off, truckers may find themselves on the road and unable to participate in seasonal traditions and relaxations. HurtTrucker suggests some alternatives to help you feel less stressed, lonely and left-out. Celebrate anyway…just schedule it at a time that works for you and yours. For example, if you can’t be home on New Year’s eve, plan a party for another night. Who says we all have to bring in the new year at the same time? Use technology to keep some of your family’s traditions: Skype those carols with the kids back home; send home pictures of holiday cheer you see along the way; increase your texts or Facebook posts so that you feel more closely connected. Be creative with the tools at your disposal. One of the best ways to feel less discouraged is to help someone else. If possible, find a shelter or retirement home and roll by to spread some cheer. Kids (of all ages) are always thrilled to visit with a trucker and check out the rig. You don’t have to take presents, just drop by to visit a bit and pay attention to someone who may be as lonely as you. Share a meal or cup of coffee with another trucker…let the holidays be a good excuse to share a table and strike up a conversation at the next truck stop. Get some extra rest whenever you can. You may not have the same day off as everyone else in the neighborhood, but you deserve some holiday downtime too. Remember that truckers have delivered most of the stuff everyone else is enjoying, so BE PROUD OF YOURSELF FOR JOBS WELL DONE! These are just some simple ideas. If you have others, please share on our Facebook page. 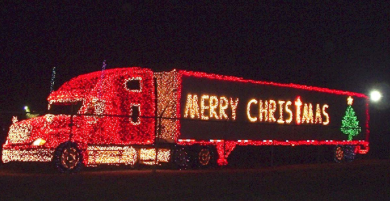 Holidays present special challenges for truckers and their families. Find ways to deal with the stress and, even if it has to be a little different from other people’s, enjoy the pleasures of this time of year!